“Taste the Feeling” features the studio wizardry of Swedish DJ, artist and producer Avicii with the addition of the soulful voice of Conrad Sewell, the London-born, Australia-raised newcomer featured in Kygo’s breakout 2015 single “Firestone.” A first acoustic version by Sewell is being featured in various TV spots for the new campaign, which Coke revealed today during a media event in Paris, and the lead single with Avicii will be released soon. Avicii also will produce additional releases of “Taste the Feeling” for Coke’s UEFA EURO 2016 and Rio 2016 Olympic Games campaign later this year. Download “Taste the Feeling” here (right click/save as). Last summer, Coca-Cola started working on a new song inspired by the “Taste the Feeling” creative idea, which celebrates the everyday moments made more special by any Coca-Cola. “As we searched for the perfect song, this one stood out from day one as something really special,” said Joe Belliotti, head of global music for The Coca-Cola Company. The team’s focus then shifted to finding to find the right voice for the song. Sewell – a 27-year-old star in Australia and Europe who’s starting to break through in the U.S. – immediately jumped out. “When we first heard Conrad sing live, we were blown away,” Belliotti said. “He’s gifted with an exceptionally beautiful voice. In December, he flew to Stockholm and spent three days with Avicii arranging and recording a special remix of the song. “It was amazing to see him add his magic and bring a dance vibe to the song,” Sewell said. 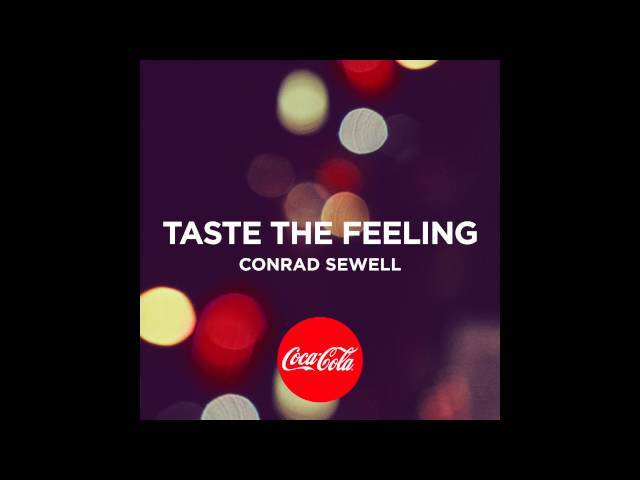 “Taste the Feeling” includes a new audio signature inspired by the sounds of enjoying a Coca-Cola – the pop of the cap, the fizz and, ultimately, refreshment. The mnemonic, created in partnership with Deviant Ventures, replaces the five-note melody featured in the “Open Happiness” campaign. "It was key for us to not only create a memorable and timeless mnemonic but also to make the tagline hummable and singable,” said Umut Ozaydinli, chief of possibilities at Deviant Ventures, said. In fact, “Taste the Feeling” is the first Coke-branded song in recent memory to include the brand name (Coca-Cola is mentioned twice) and tagline in the lyrics. “It’s a feel-good song I think people will enjoy and want to download. I’m proud to stand behind it,” said Sewell, who recently released his debut EP, All I Know, and kicks off a U.S. tour tomorrow night in New York City. From distributing sheet music for family sing-a-longs in 1905 and “teaching the world to sing” in the 1971 “Hilltop” commercial, to a partnership with Spotify in 2012, Coca-Cola has used music to tell its story bring its campaigns into the pop culture lexicon for over a century. Music plays a key role in additional “Taste the Feeling” commercials, too – from a cover of “Under Pressure” by Queen and David Bowie, to a new version of Avicii’s “Hey Brother”, to Alexander Cardinale’s “Made for You”. Deviant Ventures handled overall music supervision and licensing for the campaign.